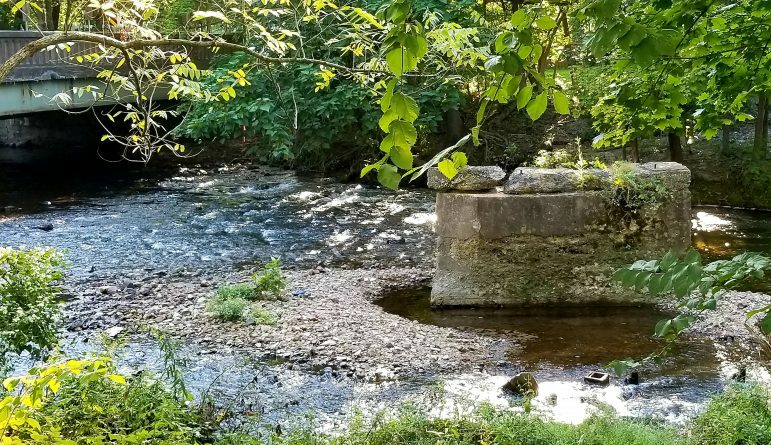 It’s been there so long that it’s practically become part of the natural environment, which may be why little thought had been given to the former railroad bridge pier that forms a kind of island in the middle of the Saucon Creek just north of Hellertown’s Water Street Bridge–until Tuesday, that is. Roger Jurczak, Vice President of the Saucon Valley Conservancy, came before Hellertown Borough Council to ask whether the pier can be saved from demolition when the 1938 bridge is dismantled for replacement next summer. The conservancy is headquartered nearby, at the historic Heller Homestead on the west bank of the creek. The concrete pier today is the only remnant of a span that carried locomotives to the Thomas Iron Works in Hellertown from the late 1860s to 1920, long before the current Water Street Bridge was built. The old railroad bridge pier can be seen mid-stream on the right. The Water Street Bridge is on the left. The Thomas Iron Works was located along the creek to the north of Water Street, in the area that is today colloquially known as the Cinder Banks. Jurczak argued that it thus has historical significance to the area, and was joined by Joe Sofka of the Hellertown Historical Society in asking council that it be saved. Councilman Kevin Lott questioned whether the pier may have contributed to past flooding–as an object upon which logs can become lodged–and whether its removal could help alleviate future flooding. A nearby derelict dam that watershed experts say has contributed to flooding in the area is supposed to be removed. Lott ultimately decided to back a motion to ask PennDOT to spare the pier from demolition when it removes the bridge over a two-month period. The proposed historic preservation measure was also endorsed by Hellertown mayor David Heintzelman.